Chanel Le Vernis 767 Fraicheur: it was inevitable that this would feature. I obsessed about getting this nail polish before I managed to get it, and I obsessed about it even when I did get it. This has to be one of the prettiest colours I own, and not only is it truly dreamy, it's so easy to apply and surprisingly long lasting for a Chanel polish. Win-win. Korres Wild Rose CC Cream in Medium: When I initially picked this up in Greece, I was quite excited about it, but it was rather thick for the hot weather there. Now that I've been back in England for a while, I've had a chance to really appreciate this. It's quite thick, you can really tell it's a CC Cream as opposed to the Chanel Healthy Glow Fluid I was using, and so it covers up redness and creates a very light veil of coverage over imperfections. It won't mask them completely, but it's enough for me to feel like I can get away with just this and no concealer when I'm on a quick trip to the shops. Jo Malone Eau de Cologne in Blackberry & Bay: Yep, this is here again. One of my discoveries in late spring, I've been loving it for summer. 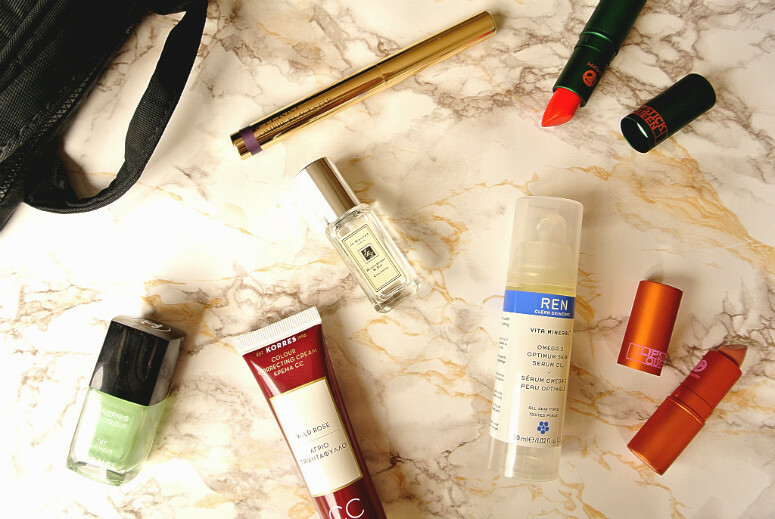 The small bottle I have means I can carry it around with me in my handbag or when I'm travelling, and top up easily. By Terry Ombre Blackstar in Violet Orchid: I love these, but normally Misty Rock would be my go-to. This month however, I've appreciated how lazy I can be using this, and the fact it can be my eyeshadow and eyeliner in one. REN Vita Mineral Omega 3 Optimum Skin Serum Oil: This is a little thick for hot days, but considering how England has been having its usual summer temper tantrums, I've been cracking this out on the cooler days and layering this on. Coupled with a good hyaluronic acid, such as the Deciem Hylamide (on a good day, read my thoughts on that here), this sinks in, and I can feel it nurturing my skin all day. Lipstick Queen in Jungle Queen: I've had this for a while but it's only this month really that I've found myself reaching for it. A lovely orangey-red that is very comfortable to wear, this is has been my go-to red lipstick for nights out of late. Lipstick Queen in Hang Ten: I am surprised by how much I've been enjoying this . It's so sheer and barely there, and basically a lipgloss/lipbalm, but I can't help but reach for it and slick it on when I don't want to commit to a lipstick all day, but want to add a little something to my lips to complete my look. Plus, I'm a sucker for that orange packaging! So that's another month's favourites done and dusted. What have you enjoyed this past month? Nice favourites my dear, it's so nice to try new things!! Thank you! Yes, it's always so exciting!